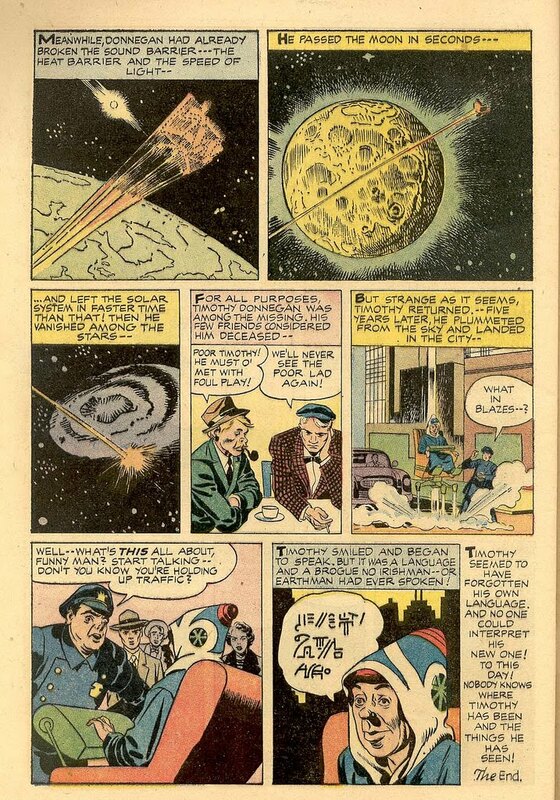 One thing I had failed to realize about The Eternals was that Kirby's depiction of the Deviant invasion of Manhattan wasn't quite the exercise in 50s nostalgia I had originally taken it for. In fact there are interesting to parallels to one of the most popular posts in the history of this blog, the interview with Nick Redfern concerning his book, Final Events, dealing with efforts of the real-life secret society within the Pentagon called the Collins Elite to portray the postwar UFO wave as the work of demons. The Elite's propaganda war was wildly successful and continues to bear fruit today. However, their ultimate goal of usurping the Constitution and establishing an Old Testament-styled theocracy was unsuccessful, so far at least. As discussed before, Kirby saw humanity accompanied by two races of elusive companions: the Eternals (the Nordics of UFO lore, roughly), who lived on distant mountaintops waiting for the time in which they would act as servants of the space gods known as the Celestials (roughly analogous to Lloyd Pye's "Terraformers") and the Deviants, the Reptilian former masters of Earth whose home of Lemuria was sent beneath the Pacific Ocean when they defied the will of the Celestials. The Third Host of the Celestials ended the Deviant rule over humanity and since that time only fleeting contacts have been made between humanity and its cousins. These contacts were ultimately passed down in folklore as encounters with fairies, gods, demons, angels, gremlins, and other such supernatural creatures. The tyrannical rule of the Deviants remains locked in human memory, and the shapeshifting, reptilian Deviants continue to haunt the dreams of humanity in the form of devils and demons. 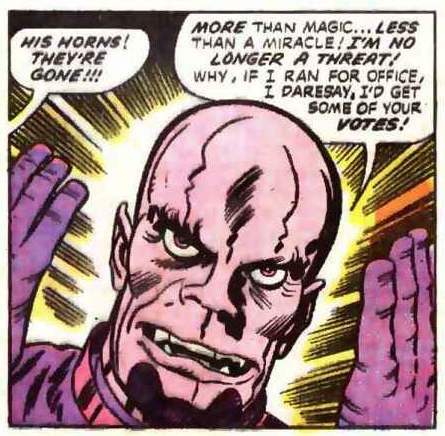 The Deviants are ruled by Tode (almost certainly based on Kirby's old DC nemesis Mort Weisinger, famously described as a "malevolent toad") and their forces are led by Anton LaVey lookalike General Kro (who rivals the Eternals for longevity, and was most likely the inspiration for the biblical Satan). 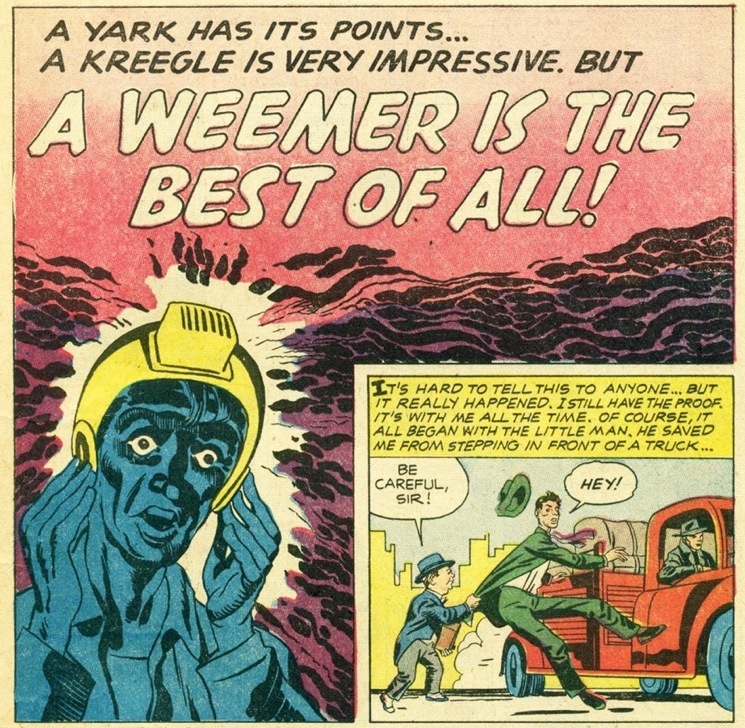 After failing to prevent the Eternals from lighting the Cosmic Beacon that will guide the Celestials to Earth, Kro(wley?) then devises a strategy straight out of the Collins Elite playbook. Realizing that the entire world is terrified of the looming Celestial motherships, Kro stages the ultimate false flag invasion. 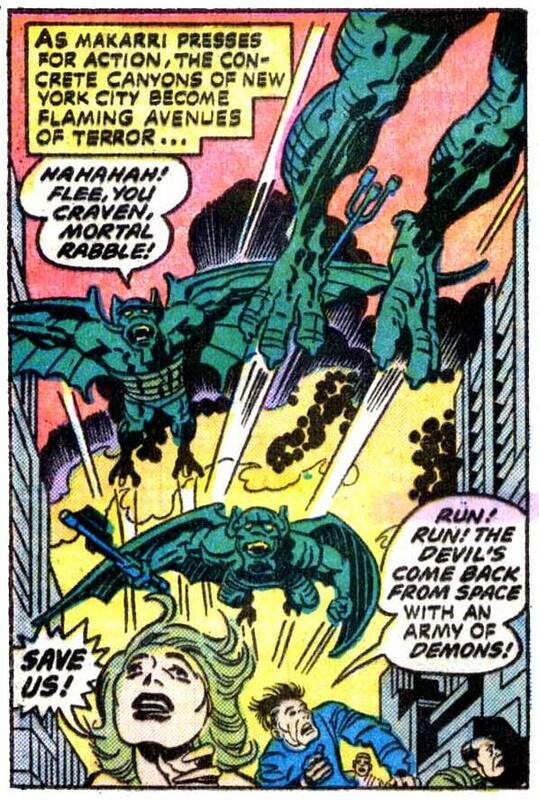 Using his shapeshifting skills, Kro grows himself an enviable set of horns and assembles a Deviant squad of USOs (posing as spaceships, mind you) and stages his own 9/11 writ large. His plan is that the nations of the earth will see the Celestial motherships -- and hopefully the Eternal strongholds-- as the source of the space-demon invasion and launch their nuclear arsenals at the Celestials. If nothing else, the resulting fallout will do away with those pesky humans for good. The whole scenario also recalls another Secret Sun greatest hit- the Project Blue Beam debunking. Was The Eternals another source for whomever was feeding disinfo to Monast? Doubtful. But I'll tell you, I was wondering just recently if the Collins Elite were themselves the authors of the Project Blue Beam hoax, seeing how its main target was the illusory "New Age one world religion" chimera. From what Nick Redfern has told us about them, they certainly were ideologically compatible with Monast, if nothing else. One thing I did find interesting however was that the Eternals' Unimind ritual-- described as just that, a ritual-- was centered on a blue beam. Coincidence? Well, only so much as it co-incides with all of the rest of this madness. 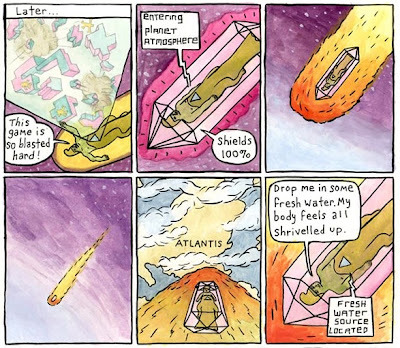 Forming is one of those webcomix that I'm not sure I'm not hallucinating. it seems to have emerged from my unconscious, or perhaps your unconscious, or yours. Or even you back there. One thing for sure, the one actually channeling Forming for us is artist/musician Jesse Moynihan, who hosts Forming on his eponymous website. Reading Forming for the first time gave me the same feeling that I got reading the Hernandez Bros' early work or Carla Speed McNeil's Finder; that weird, trippy, sensation of being pulled out of boring, horrible consensus reality and into a world far more interesting and enriching -- though considerably more unsettling-- than our own. What's Forming actually about? Well, it's kind of like talking to a really smart but slightly skewed guy who's been up all night tripping balls, reading The Eternals and Devil Dinosaur and 2001: A Space Odyssey. Which sounds kind of facetious and reductive (not to mention redundant), but words really fail to convey the Forming experience. As it should be. Suffice it to say, after reading Forming I got the very strong feeling that I was in the presence of a creator who has tapped into something impossibly deep and ancient. The more he tries to distance himself from this revelation with Gen-Y absurdist humor and cartoonish violence, the more powerful it all becomes. As if he can't run from the fact that he is telling a story that all of us know but few us can recall. A story that can only be told in metaphor because the facts always come up short. So what you really need to do is go to Jesse's site and read Forming from the beginning here. Then you'll see what I mean. Don't blame if you fail to get anything done for the next several hours. Just don't read it at work, whatever you do. Now, let's hear from the artist himself. SECRET SUN: Jesse, give us a short sketch of who you are, where you come from and what inspired you to undertake this epic comic strip. JESSE MOYNIHAN: I'm Jesse Moynihan. I grew up outside of Philadelphia. 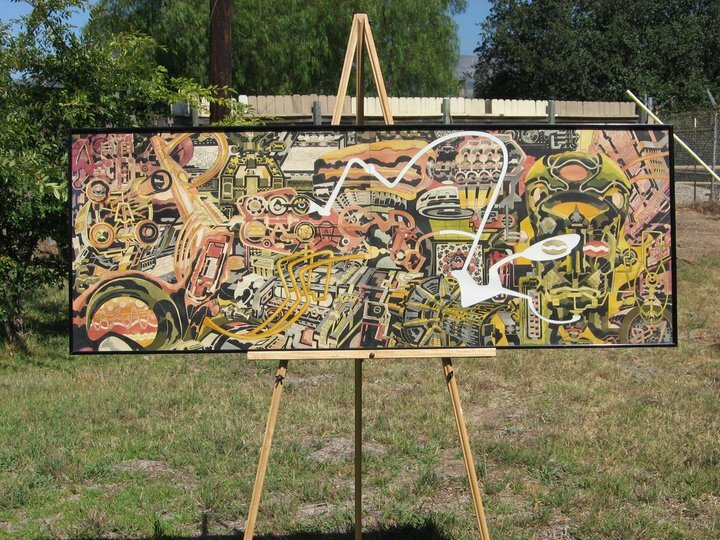 Forming is a collage of everything I've mused about since my early twenties. At some point I had to pick up a pen and bring it to the page, or else I probably would've had no good reason to tell stories anymore. Let's talk about Forming. I realize this question might drive you nuts, but give us a short synopsis of what Forming is about. Roughly. Forming is about selfishness, selflessness, gods, aliens, destruction, creation and the dawn of individual consciousness. 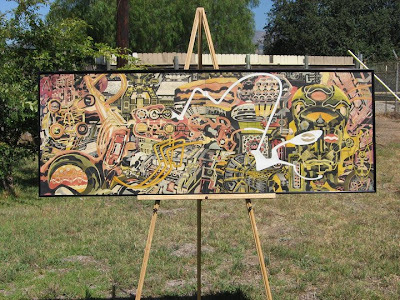 A lot of it deals with the different ways which we manifest/interpret our vital life force? It's hard for me to give a concise and real answer to this question because I'm really just grasping in the dark with Forming. You have a large and diverse cast of characters drawn from mythology. What's the connection for you between the characters? Between myself and the characters? I have a strong connection to a lot of the characters. I pulled their names from mythology, but their traits are based either on different aspects of my personality spectrum, or on things I see in other people that I either find admirable or you know, repulsive. There's a lot of androgyny at play in your characters. Do you believe in "gender as a construct" or does the ambiguity refer to mystical figures like Adam Kadmon and the Rebis? This is going to be hard to answer. I'll try though. I've been fascinated with gender for a long time; my own conditioned understanding of gender, growing up as a half Japanese male and the societal baggage that I either embraced or questioned. I romanticise masculinity in its sprawling incarnations, in particular the traditional Japanese archetypes. So that's sort of my natural mode on the day to day. But I also get a kick out of trying to flip my perceptions, especially in my writing. I got into the idea of a combined man/woman super-being after watching a documentary on Philip Glass and learning that Akhenaten was a hermaphrodite. This helped me build a thematic interest in gender combos and the possibilities/implications of power that could result. Once you become interested in that sort of thing, androgynous super beings start appearing in a lot of places. So I feel like I'm a part of some ancient storytelling tradition by including those themes. It just makes sense to me that the combination of man and woman would create super powerful fighters. Alright well, I don't think I succeeded in answering the question, but that's a part of it at least. For me, writing is about finding contradictions in the characters and in my own daily assumptions. So part of that is addressing something like gender because I am aware of my comfort zone when it comes to the topic and I want to f**k myself up. You draw on several different characters from different mythologies. Did you grow up reading mythology or was this a more recent interest for you? I was always pretty into muscle dudes fighting monsters or other muscle dudes, growing up. As I got older I latched on to the theme of transformation that runs through most myths... all myths? Yeah, that's what really interests me these days. Are there any particular esoteric traditions you feel drawn to or any that you study? I'm not drawn to any particular esoteric tradition. I guess I pick up pieces from here and there that resonate with me. I adopt a lot of those modes of thinking and then usually forget where they came from. I've always been a daydreamer, so hardening into one branch or discipline has never been that appealing to me. I think, anywhere you go, you're going to run into wise people and it's good to be receptive and loose with everything. What are your influences as far as artists and writers go? I think my early foundations were Dave Sim, Jim Woodring, Peter Bagge, Moebius, Robert Crumb, Frank Herbert, David Lynch, and Samurai/Kung Fu movies. Later in life, I've felt influenced by Amos Tutuola, Comte De Lautreamont, Sun Ra, C.S. Lewis, Yuichi Yokoyama, Manly P. Hall, Joseph Campbell, Alejandro Jodorowsky, Seijin Suzuki, Rene Laloux, Coast To Coast, and John Boorman's movies up until Emerald Forest. There's a lot more, but that's probably a good overall picture. I used to want to be a filmmaker. I went to film school. 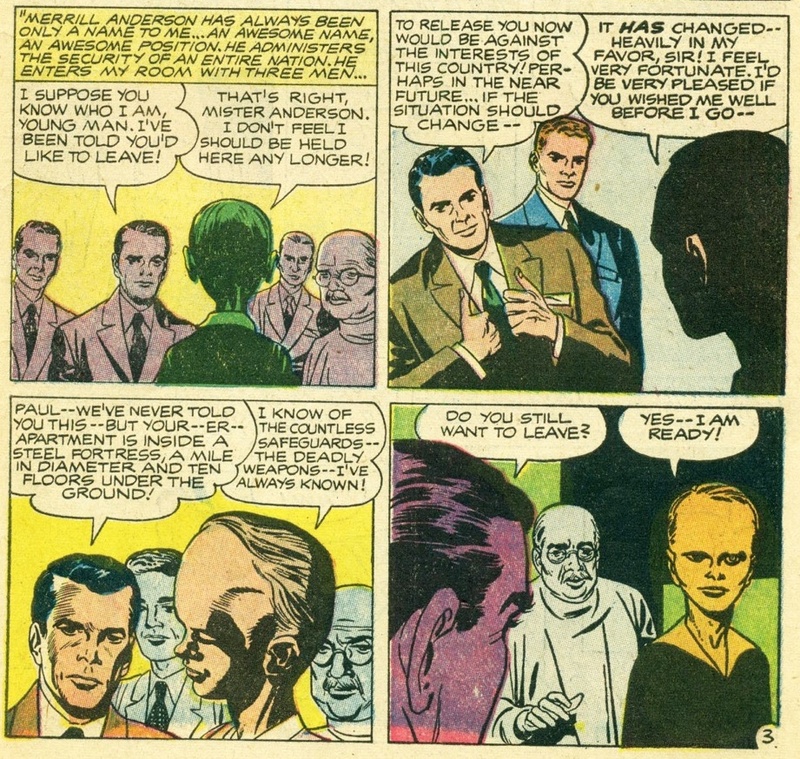 Jack Kirby said that he simply projected what was in his head onto the paper and traced it. Is your process similar? Yeah, I guess it's sort of like that. For me though, I project what's in my head and then try to remember the projection as I go along and reinterpret it. I like to edit as I go. I guess I wouldn't do that with my hair. Did you sue Passion Pit for stealing your crystal starship idea, which is why they redid the video for "Little Secrets?" I didn't see it. I've never heard Passion Pit. Are they any good? 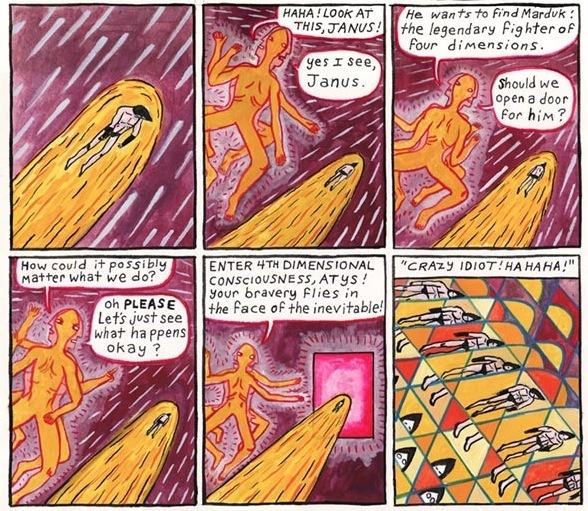 Who are some of your favorite contemporary comic artists? Yuichi Yokoyama, Dash Shaw, Sammy Harkham, Tim Hensley, Christophe Blain, Vincent Girard, Jonny Negron, and Michael Deforge are at the top of my list recently, but there's lots of other people I'm into. 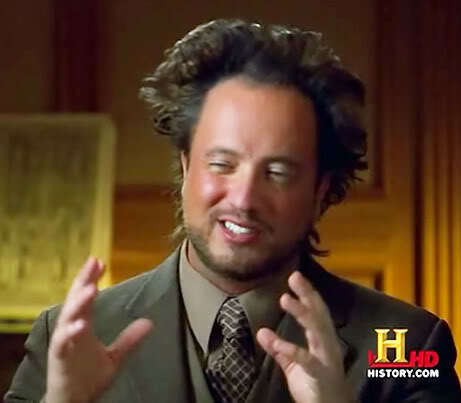 UFOs: alien science nerds or interdimensional tricksters? 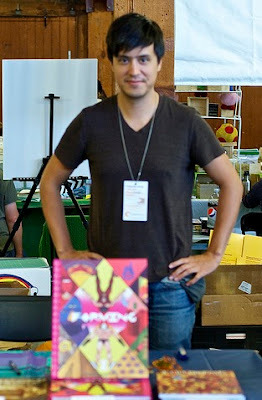 What are your influences or interests outside of comics? Outside of comics you know, I read a lot about different modes of thought. Right now I've been trying to get into some Rudolph Steiner, and I just bought Robert Lawlor's sacred geometry workbook. I write a fair amount of music in my spare time. I listen to a lot of Prog, Kraut, Psych, and a lesser amount of free Jazz and modern Classical. I've been trying to get a broader knowledge of early Electronic music. I just started brewing kombucha. I guess that's sort of a hobby. What kind of response have you gotten from the comics community? Did you catch heat from your peers because Forming isn't your masturbation memoirs? All the response I've gotten has been super positive. It definitely helps me feel good about what I'm doing with my life, even if it makes me zero money. But I have a day job for that anyway. I've written a lot about some of the more apparent connections and prophecies made in Jack Kirby's comics, and in our last installment we looked at an issue of Black Cat Mystic that essentially contained the basic building blocks of Jack Kirby's AstroGnostic opus, The Eternals. We saw the psychic posthuman race congregating atop Mount Everest, the alien technology transfer that led us in the Andes Mountains and finally into the hidden temple of a cargo cult centered around a giant space god frozen in a state of suspended animation. 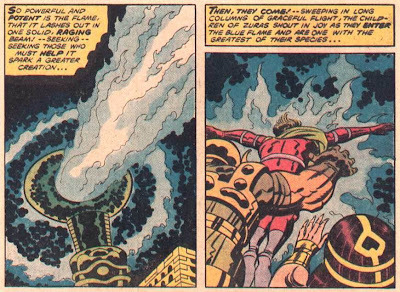 The Eternals was not a perfect series by any means. 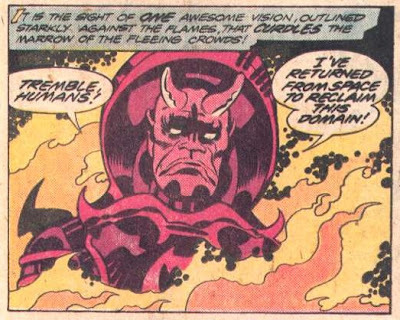 Kirby never seemed quite sure what he wanted to say about the return of the Celestials, and the book often lapsed into a kind of New Gods rehash. There were moments of genius, however, usually when Kirby stuck to the basic theme of how the world reacted to the arrival of giant aliens in their midst. Those moments put the Fourth World stories in the shade, for this reader at least. 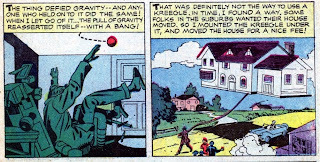 But Kirby's return to Marvel wasn't quite the replay of the Silver Age glory days anyone had hoped for. 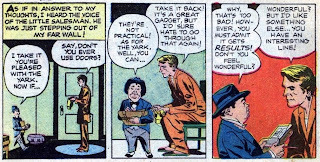 And Stan Lee's directive that his editors put the Hulk in all their titles to cash in on the success of the CBS TV series (on which Kirby himself guest-starred as a police sketch artist) seemed to take all of the wind of Kirby's sails. 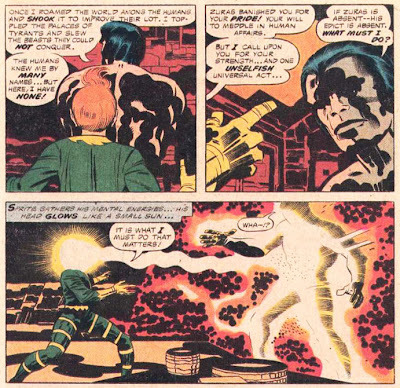 From the first Hulk story (#14) to the premature end of the series (#19), the quality of the art and the writing seemed to utterly collapse, a pattern that seemed to follow all of Kirby's late 70s titles. Books like 2001: A Space Odyssey and Black Panther had similarly inspired starts and similar collapses half or two-thirds of the way through their short runs. 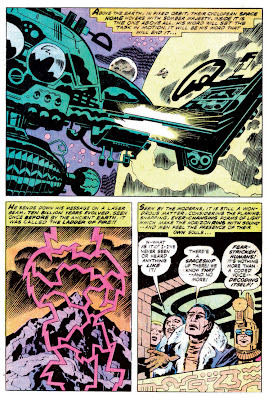 As if to mark the moment, Kirby chose the last pre-Hulk issue of The Eternals to deliver one of the most remarkable stories of his Bronze Age career. As we've come to expect, the story is bursting with prophetic reverberations of an oblique and dreamlike variety. It's as if we're viewing the future through a funhouse mirror, or a kaleidoscope. With one indelible exception, we see only fragments of prophecy. But the exact connections are unclear. Or elusive, if you prefer. For some reason, it's exactly these kinds of connections that feel more real to me. But first, some background. 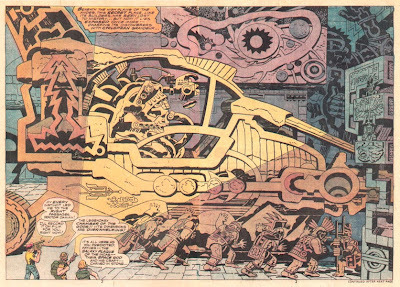 In Eternals #7, three SHIELD agents are teleported by the gods into the company of the Eternal Ajak (decked out in full Incan ceremonial garb) and a human archaeologist, who are in a secret chamber within a pyramid in the Andes Mountains. They are observing a Celestial landing party collecting genetical information-- DNA-- in preparation for Alpha Day. Orbiting overhead is a massive mothership (note green color, mirroring SOHO footage) containing the nameless prime Celestial. He communicates through a laser beam which resembles a ladder (almost certainly inspired by the Jacob's version of same). This story was written a very long time before optical storage and encoded information became common parlance. The ladder contains the coded commands of the supreme Celestial, eeerily prefiguring recent theories of aliens communicating over vast distances via neutrino beams. The Eternal and the humans watch the ladder descend and suddenly the giant Celestials are transported through the ladder's code to other parts of the globe. After a Celestial attacks the Deviant (read: "Reptilian") stronghold of Lemuria in #10, the leader of the Eternals attempts to psychically contact the orbiting Godship (bringing us back to one of Kirby's favorite themes) but is violently rebuffed. Note that the Eternal is using electronic equipment to make psychic contact. Remember this event as well: the Celestial's attack-- and the motivation behind it-- is central to the Mindbomb we're setting off here. Zuras then summons all of the world's Eternals to unite into a single superbeing called the "Unimind," a being that can stand on equal footing with the Celestials. The Eternals have even brought along some pet humans to take part in the ritual transformation, in which the blue flame transforms the life force of the Eternals into a single being of mind and light. 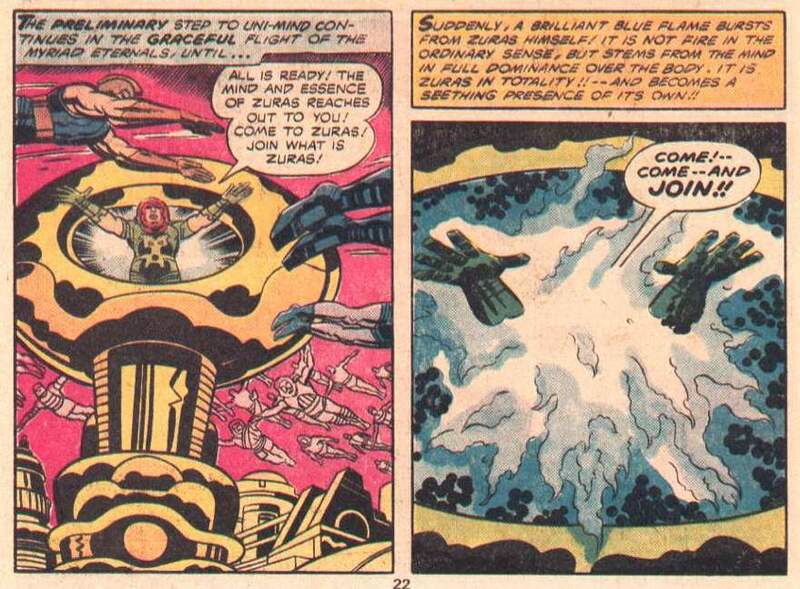 Here Kirby is clearly shifting from science fiction to flat-out mysticism. In retaliation for the attack on Lemuria, the Deviant leader, Tode (toads are amphibians and not reptiles, but who's counting? ), orders a 9/11-resonant suicide mission in which a doomsday weapon will be flown into the Godship. The resulting fallout will destroy the humans and the Eternals and allow the Deviants to reclaim the surface world as their domain. 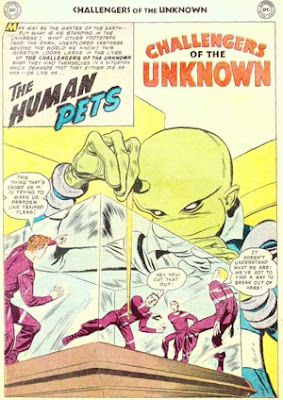 The only two Eternals who don't take part in the Uni-Mind ritual are Sprite, a trickster/leprechaun figure who is left behind to keep an eye on the store, and an unnamed hero who is in fact a thinly-veiled Hercules (the name was being used by another Marvel hero at the time). The Eternal Hercules was banished by Zuras (read: "Zeus") for his arrogance. 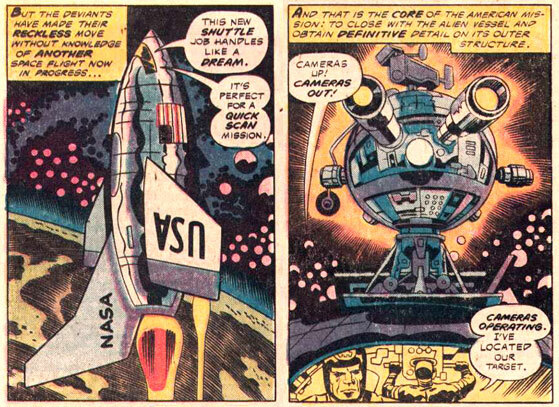 Desperate to stop the Deviants' doomsday machine, Sprite transforms Hercules into a metallic warrior (shades of Gus Grissom resonator, Ben Boxer) and conjures up a spaceship for him to intercept the Deviants' doomsday weapon with. Now, all of this is very oblique but the astronauts discuss how the ground telescopes have recorded the Godship, but the images look like "blobs." I couldn't help but think of John Lenard Walson's videos of alleged orbital objects, which we discussed here, especially as the Deviant ship shows up on the Shuttle radar (click to enlarge). 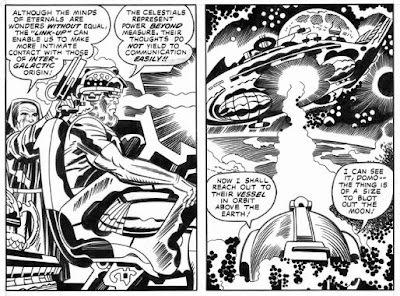 Kirby cuts loose with his trademark cosmic freakouts, the last of their kind that we'll see in the Eternals series (there'd be plenty more to come in Captain Victory, to put it mildly). The Shuttle astronauts find themselves in the middle of Deviant-Eternal grudgematch in orbit, while the enormous Godship looms over head. Again; more oblique connections, more dream reality type of prophecy, but very much reminiscent of stories I've covered about strange sightings of flaming debris falling from the sky at speeds and angles far too slow and low to qualify as any kind of meteorite, leading some people (read: "me") to speculate about a secret war in low orbit. There's also been some discussion of flaming debris sightings on the FB group from time to time and more recently the Russians have accused the US of sabotaging their $170 million Grunt Mars probe. Not to mention the fact that Kirby's basic story-- from 1977, mind you-- of Space Shuttle missions encountering giant UFOs and filming hostile action in space ties directly into a hot and contentious topic in the UFO community over the past decade. ...where he dismantles the bomb's core and is subsequently killed in the meltdown. However, he is pulled into space and into the Godship. Having proven himself worthy, Hercules is absorbed into the essence of the Supreme Celestial. More mysticism. 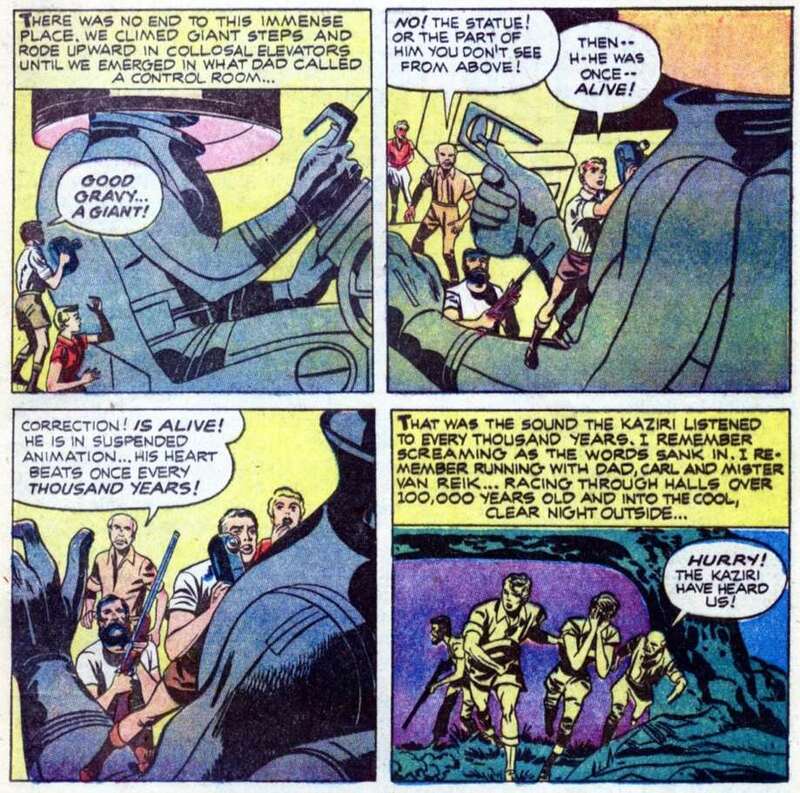 The human astronauts telepathically guide the Eternals' spacecraft to a "secret base" in the Mojave Desert, which is certainly convenient for the Area 51 reverse-engineers Kirby was obviously going to do a story about before it all went kerblooey on him. Kirby has the Deviants-- who unwittingly hijack Durgan's space shuttle-- explode over the "South Atlantic Ocean." And here's where the Mindbomb goes off again. 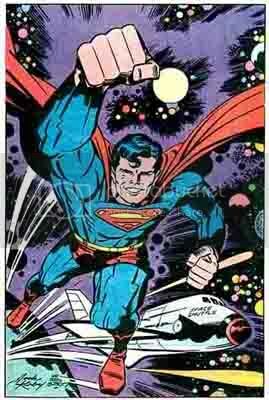 At the same time Kirby apostle John Byrne was drawing a story about Superman preventing a space shuttle explosion, the world watched in horror as the Space Shuttle Challenger exploded over the "South Atlantic Ocean," the balmy waters off the coast of Florida to be exact. I can't speak as to the authenticity of the video here, but I find it fascinating that there's at least a tangential UFO connection to the tragedy. But that pales in connection to the Mindbomb going off here. "Astronauts"-- arguably Kirby's last great story in his second run at Marvel-- deals with an ancient grudge match between the Gods and the Deviants (Reptilians). 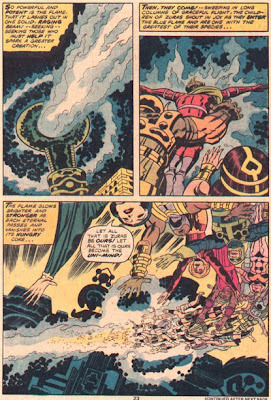 Again, the attempted Deviant assault on the Godship in Eternals #13 was in retaliation for an attack on Lemuria by one of the Gods in Eternals #10. ...those very same Deviant Astronauts --those Challengers-- explode in a NASA space shuttle over the South Atlantic Ocean. All I can add is that if you haven't yet, I recommend you read "I'll Show You How to Bring Me to Your World." Maybe that might add a measure of clarity. Or maybe it will simply confuse matters more. I don't know anymore. I don't know anything anymore. All I know I know is that this stuff is starting get under my skin now. 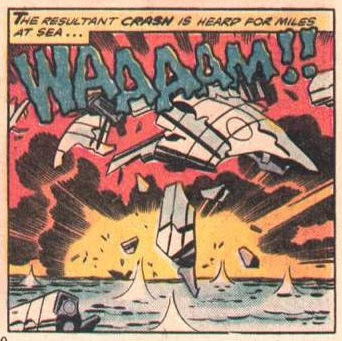 Strangely enough, Kirby's first great super-team of the Silver Age, The Challengers of the Unknown, trace their origin to a similar catastrophic aircrash, although one they obviously survived. 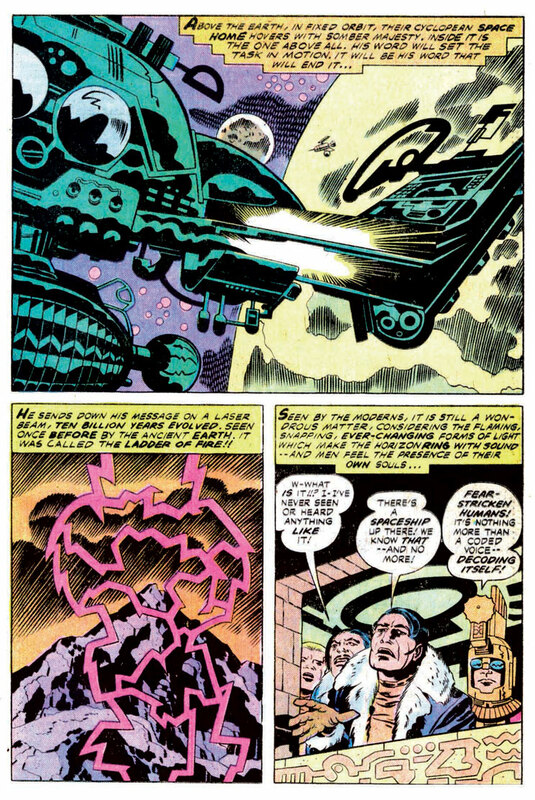 Kirby recycled the origin when he and Stan Lee created The Fantastic Four. 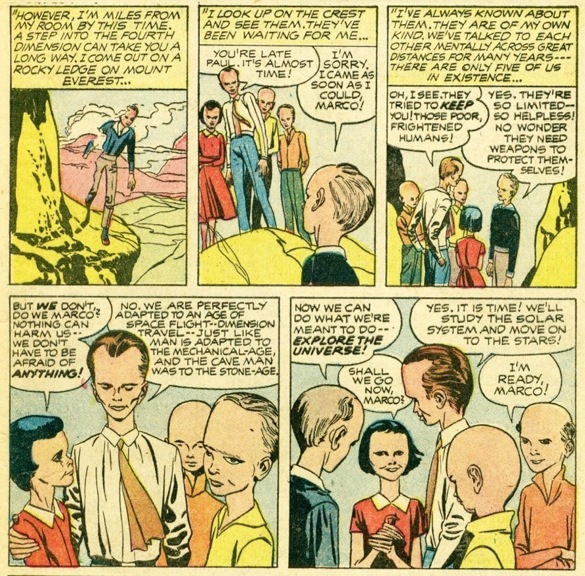 Note that Jack - who wrote and drew the Challengers-- also had the team abducted by an alien who is identical to a modern depiction of a Grey in all but color. This story was published in 1958, a full eight years before the Betty and Barney Hill story hit the pages of Look Magazine. Which should surprise absolutely no one who reads this blog regularly. NOTE: The title of this piece is ironic. I don't put any stock in the theories of lifelong Naval Intelligence asset Bill Cooper at all. * Speaking of Hercules, Kirby would do a pinup of Superman escorting the Space Shuttle in 1984, at the same time he rebooted the New Gods at DC. Unfortunately, his eyes were starting to give out and the finished product leaves a lot to be desired. 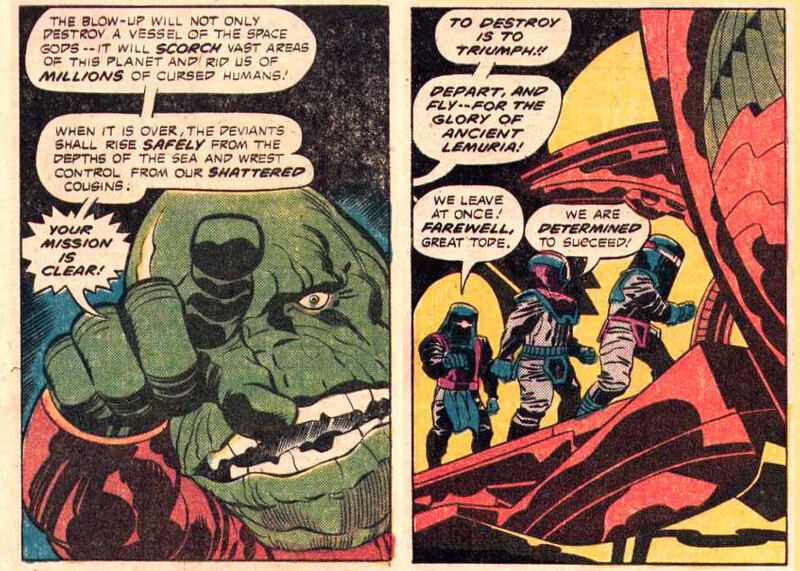 We've looked at Jack Kirby several times in the past here, most notably in his startlingly accurate (if not often allegorical) predictions of the Face on Mars in 1959, 9/11 in 1984, and the Gulf War and Iraq War in 1974 and 1975. There's also a foreshadowing of the plot of 2001: A Space Odyssey, possible Apollo mission footage chicanery, and the suppressed discovery of obelisks on the Moon by American and Russian surveying missions in the mid-60s. In ancient times, prophecy was used as an acid test, proof that a prophet or priest was in fact in touch with a god. In the Bible, the punishment for a false prophet was death (the entire EvangeliCIAl movement would be instantly leaderless if that directive were still followed today). If a prophecy came true then the prophet or priest (or priestess, certainly) would be trusted to supply information pertaining to theology, morality, cosmology and so on. In other words, prophecy was a means to establish authority. At a time when a near-majority of Americans think a talentless professional athlete is a prophet based on beginner's luck and some cute but garden-variety synchronicities, what do we make of Jack Kirby? Here's what we know-- when Kirby (born Jacob Kurtzberg) was young, he was struck down with scarlet fever. His parents were poor immigrants from Austria and antibiotics were not widely available. As young Jacob lay dying, a group of Kabbalist rabbis were called in to exorcise the demons that were killing the boy. Whether through mystical agency or through Kirby's inborn toughness, he survived. After making his name in the comics field, Kirby was drafted into the Army. His friends were lucky or connected enough to get posts stateside or working for the Armed Forces newspapers or whatever, but Kirby wasn't. He was sent to Europe, right into the crucible of the killing fields. When Kirby's commander found out he was a big deal artist in the funny papers, he decided to use him for recon. This meant Jack had to sneak behind enemy lines, sketch the lay of the land then sneak back and explain to his superiors where the Germans were and what they were doing. Kirby was often so close he could smell the Nazis' aftershave. He was sent home after contracting a case of frostbite so severe his legs were nearly amputated. Kirby spent the rest of his life drawing, usually so lost in his reveries he couldn't drive a car, balance a checkbook, or do much of anything besides create one indelible character after one classic adventure. He worked at night, in a tiny, windowless corner in the basement of his Long Island home. In the early 70s he moved to Thousand Oaks, CA, where he struck up an unlikely but close bond with neighbor Frank Zappa, 23 years his junior. Sadly, his star went in decline and his audience steadily began to shrink from the early 70s on. However, he found a new, more appreciative venue for his work-- animation. He worked on series such as The Fantastic Four and Thundarr the Barbarian while helping to establish the independent comics market as a major force in the early 80s. 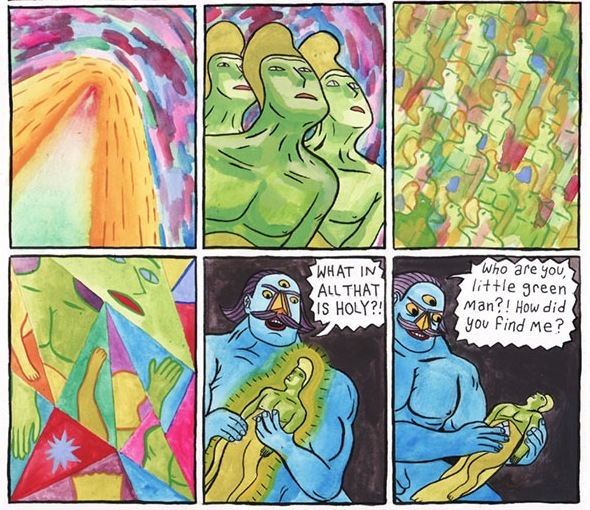 Now, I'd always assumed that Kirby's AstroGnosticism was a contact high off the psychic turmoil of the Psychedelic Era. I was wrong. I keep finding out that Jack was plugged into a worldview that Charles Fort, John Keel and Jacques Vallee would feel right at home with earlier and earlier in his career. 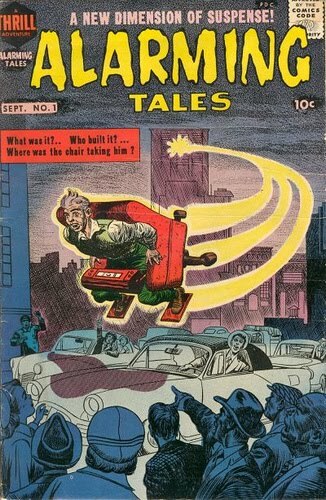 Which brings us to Sept 1957, or more accurately June 1957, since comics are post-dated three months in advance. This was the dawn of the Silver Age of Comics but a distinctly fallow period for Kirby. 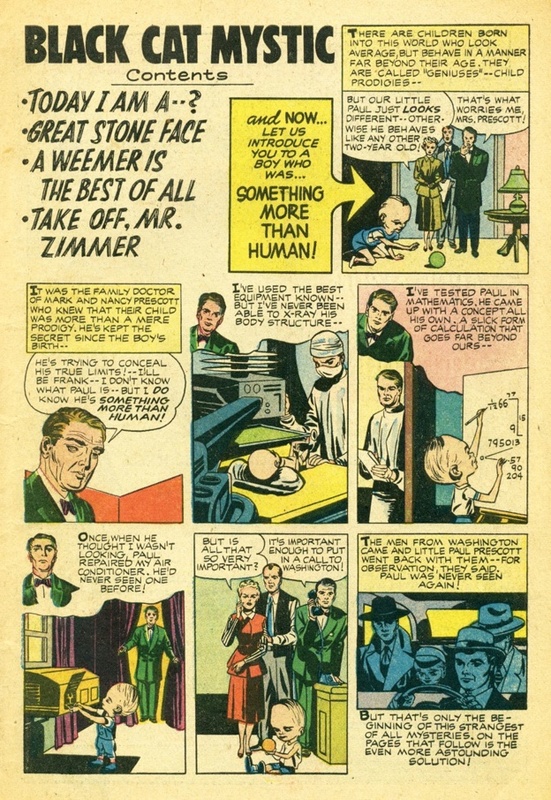 His partnership with Joe Simon had collapsed and his relationship with industry giant DC/National was iffy since his rough-hewn style was seen as out of step with the times (that problem was fixed when art-god Wally Wood teamed with Kirby on Challengers of the Unknown and produced this writer's favorite comics art ever). Jack took work whereever he could get it and got work doing sci-fi and "mystery" books for Harvey Comics, home of Casper the Friendly Ghost and Hot Stuff. Joe Simon may or may not have had some involvement in the scripting and inking, but the stories are most definitely Kirby's. 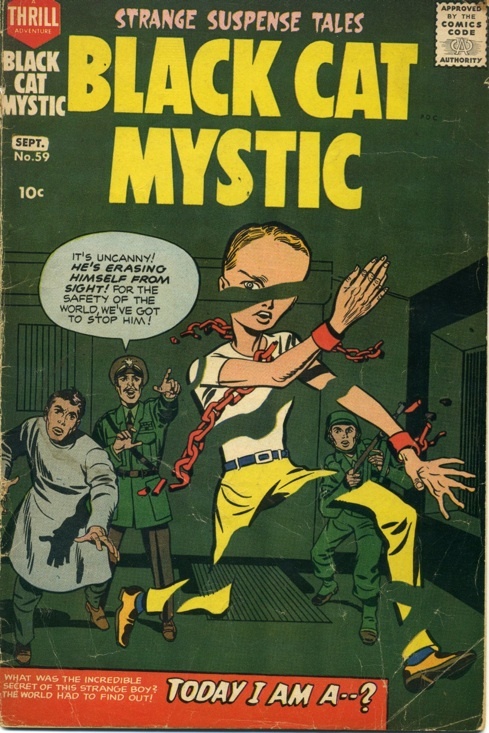 In June, Jack released two books of particular interest, Alarming Tales #1 and Black Cat Mystic #59. 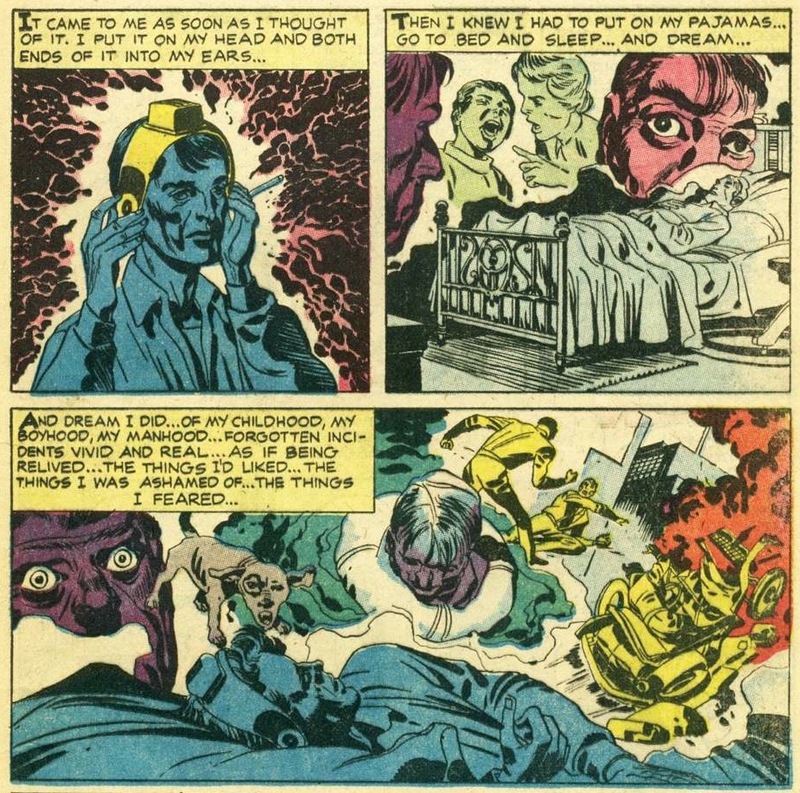 Alarming Tales contains two stories that prefigure Kirby's major 70s work. 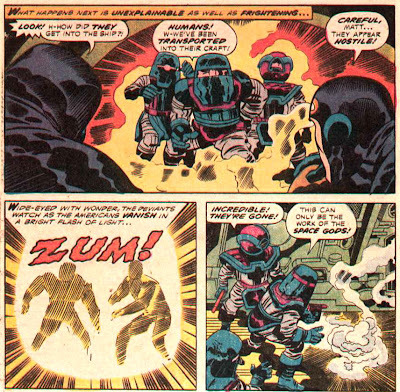 One is "The Last Enemy," a clear predecessor to Kamandi: The Last Boy on Earth, which plays such a major part in the Iraq War/Stargate conundrum. 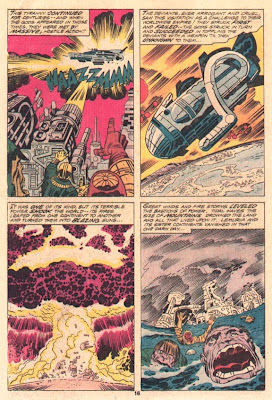 Kirby took a lot of heat for Kamandi in the 70s, with the fan press accusing him of knocking off Planet of the Apes (DC publisher insisted Kirby feature the ruined Statue of Liberty in the first issue), but Kirby not only beat the Planet of the Apes film by 11 years he beat the original Pierre Boulle novel by 7. Kind of a pattern with Jack. 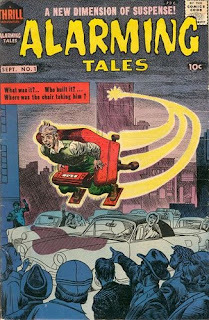 The second story is "Donegan's Daffy Chair," a startling prefiguring of what Jeff Kripal describes as Kirby's Kabbalistic "Throne Mysticism" in his analysis of The New Gods in Mutants and Mystics. The story seems to make little narrative sense- a janitor at an aerospace factory gets in an experimental rocket chair and ends up leaving the solar system. He comes back dressed in alien garb and speaking an alien language, utterly and apparently irreversibly transformed by his cosmic voyage. Space Age technology as Mystery cult initiation. 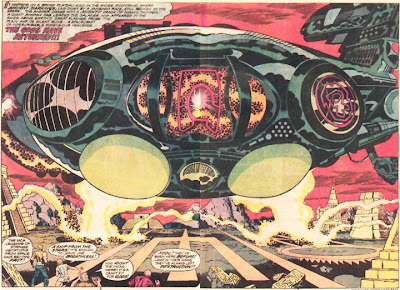 In The New Gods, Metron (read: "Metatron") used his Mobius Chair for roughly the same purpose- to travel the vast reaches of the cosmos in search of transformative experience. Alarming Tales #1 also presents us with a story about a man who meets a beautiful Dana Scully lookalike from Mars who travels back and forth to Earth using a transdimensional Stargate. The story itself is as meh as "Donegan," but clearly shows the very, very strange and esoteric issues running through Jack's mind at the time. The art is interesting as well, in that it clearly seems to prefigure Steve Ditko's alien dimensions in his classic Doctor Strange run. Quite strongly, in fact. 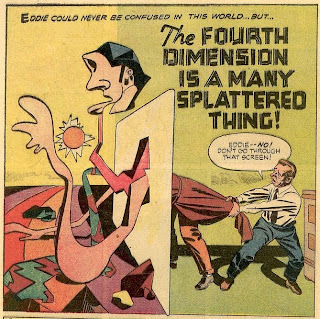 Donegan's trip across the cosmos was repeated in Kirby's Space Odyssey/Moon Obelisk dual prophecy, "The Great Moon Mystery," drawn in 1958 but not published until 1966. 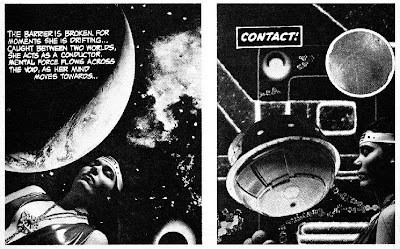 In that story the astronauts are transformed into beams of light and shot across the Universe (shades of Chris Carter) in an experience that feels like minutes for the space trippers but lasted for weeks. Alarming Tales had two more stories of interest- one was "The Cadmus Seed," a sci-fi story about breeding plant-based supersoldiers that namedrops Cadmus (father of the Samothracian Mysteries) and his army of Spartoi sown from dragon's teeth (loosely borrowed as an army of skeletons sown by the hydra's teeth in the greatest movie ever made). Another story tells the story of a man's virtuous, self-sacrificing dog who is later reincarnated as his son. However, Alarming Tales- with its stories of cosmic apotheosis, transdimensional romance, mythology-inspired cloning and reincarnation-- is all just preamble. The real action on the stands in June of 1957 was most certainly in the pages of Black Cat Mystery #59. 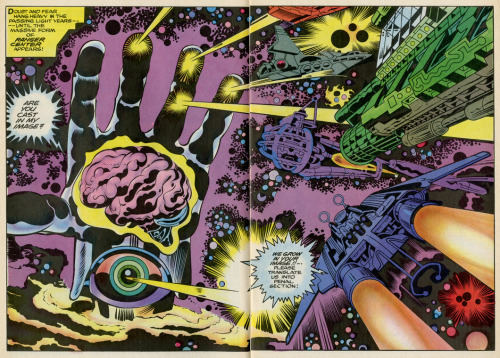 Here we see the three major themes of Jack Kirby's AstroGnostic teleology laid out before us in glorious four-color. The cover story would have made a great Mytharc episode on The X-Files. 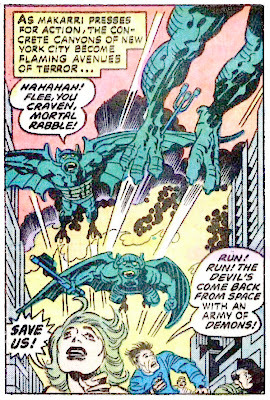 It's also remarkably similar to themes Kirby and Lee would explore in The X-Men. It tells the story of a young boy named Paul who begins to display unusual mental powers from an extremely young age and is taken into government custody to be studied. He's kept in a deep underground bunker where he's treated kindly but with extreme caution. When Paul reaches adolescence, he announces that he is going to leave the bunker which causes the base to go into lockdown. Paul's captors are reasonable but firm- they clearly fear him and are not entirely sure they can hold him. Now, remember this story is being published during the height of the Cold War at a time when any deviation from conformity was seen as tantamount to treason (particularly in a comic book). Kirby here is telling a story of a superior being who is openly defying the military establishment and isn't interested in being used as a weapon against Communism. Returning the concept of interdimensional travel again, Kirby has Paul throw his captors offguard and escape from his underground prison by erasing himself from the Third Dimension, an act which is "child's play" for Paul's new race of beings. Harking back to the old pulp themes borrowed from Theosophy, Paul meets his fellow new beings on Mount Everest. Note that they are all variations on the Grey type: thin, diaphanous, with oversized heads and eyes (they also have six fingers on each hand). 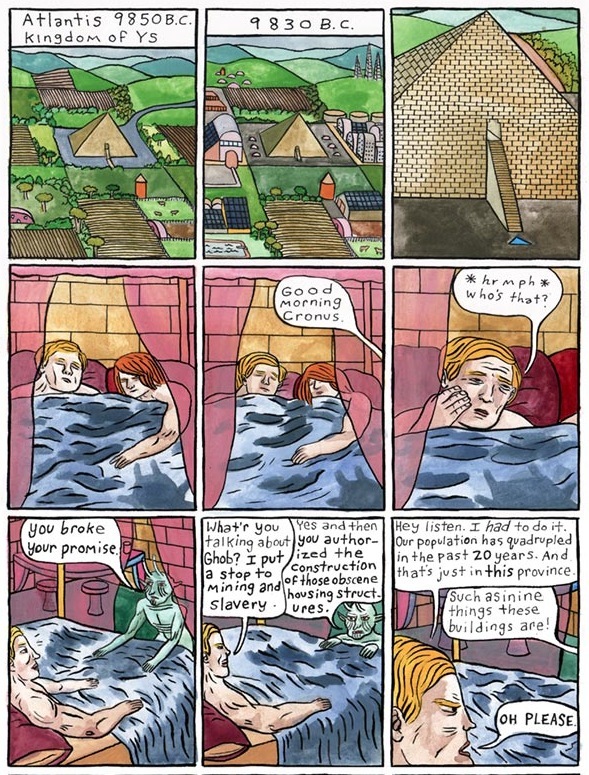 This story was drawn several years before the Grey type would become popularized. ...they merge into pure ball of energy and travel at the speed of light. Whether or not they leave their physical forms behind or reconstitute when they reach their destination is unclear. 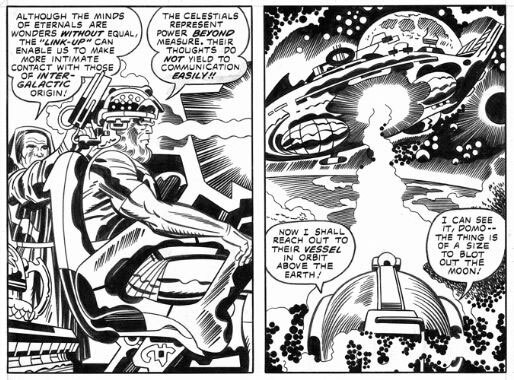 What we do see is a theme Kirby would explore throughout his career-- traveling the cosmos using nonphysical-- in this case, apparently psychic-- means. The second story is more like a lost Twilight Zone or Outer Limits episode, though it predates both. A guy who's down on his luck meets a leprechaun/trickster type who presents himself an traveling salesman from outer space, offering free samples of alien gadgetry. 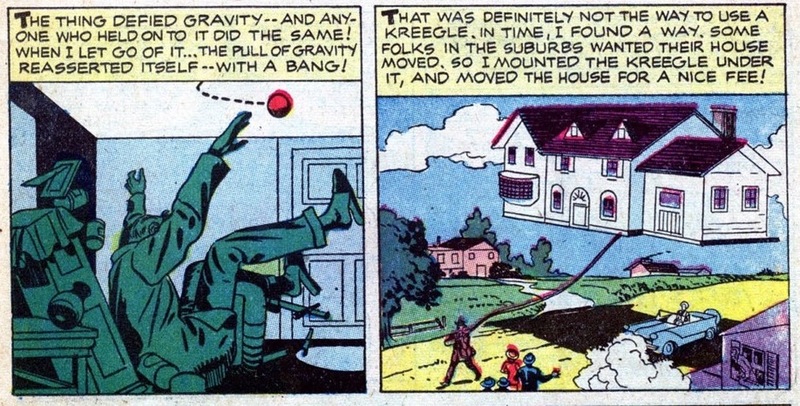 The first device is a kind of psychological repair system, which offers Kirby the opportunity to dip his toes in some of the psychedelic/freakout imagery he'd immerse himself in ten years later (note the "Kirby Krackle" prototype). 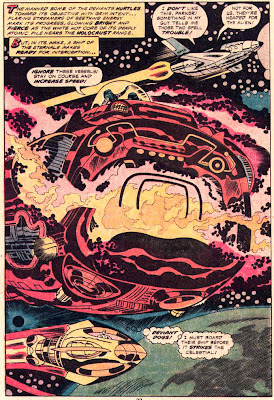 The art here is crude and rushed-- Kirby was never comfortable inking his own work. Nevertheless, this follows the pattern we've seen over and over again in the Alien Dreaming and the Widening Gyre series; revelation--often a technological revelation-- preceded by nightmare or psychedelic freakout. Here we also see the kind of narrative that has been reported for millennia-- "little people" walking through walls, bearing gifts of unimaginable power. And the gift that comes help make the newly healed man unimaginably rich? An antigravity device. The lucky fellow hires it out to move houses and heavy equipment. Perhaps his ancestors would have used the same device to use megaliths for solar observatories, thousand ton blocks of limestone for pyramids, giant stone heads for ceremonial purposes... are you catching my drift here? 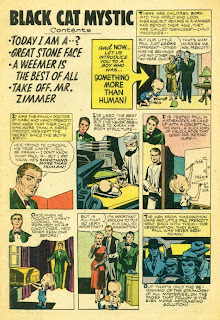 Deciding that big business is too stressful, the man takes the "weemer"--a psychically powered teleportation device-- which he uses to travel to Peru, home of the Nazca lines, the Vicús pyramids, Machu Picchu and all the rest. 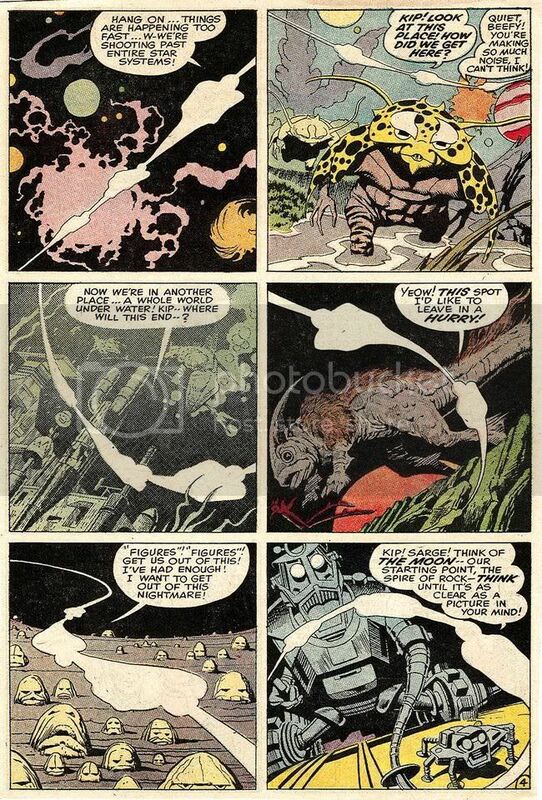 Of course, Kirby would later revisit the Andes region for the most explicit "mystical" manifesto of his career. Unconsciously following the "reversal of time" motif of ritual drama, Kirby takes us backwards from Posthuman Apotheosis to the Alien-Alchemist Technological Exchange and finally to the AstroGnostic revelation: the footprints of the Stargods themselves. 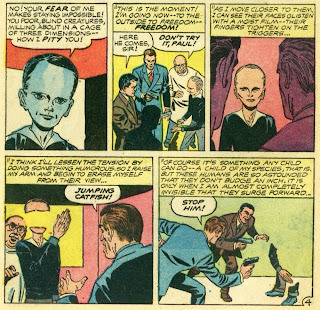 We take this all for granted in the Era of Tsoukalos, but in 1957 this was almost completely unheard of. Not to mention completely subversive, when that word carried real consequence. 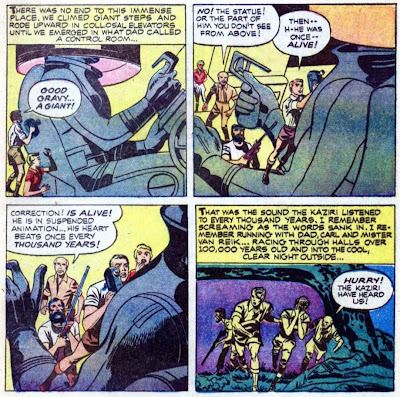 Kirby presents us with an archaeological team who stumble on a lost African tribe who pray to a giant stone head. After observing the tribe and their rituals, the scientists come to a shocking conclusion: the tribe is a cargo cult and their shaman is dressed as an astronaut. If this story seems familiar to you you may remember it from the Chariots of the Gods? documentary, which showcased the work of an anthropologist who had studied the customs of an isolated Brazilian tribe called the Bep Koroti in the early 50s but would not publish his findings until the 1960s. Again, this story was published in 1957. As with Kamandi, Kirby was accused of ripping off Chariots of the Gods? 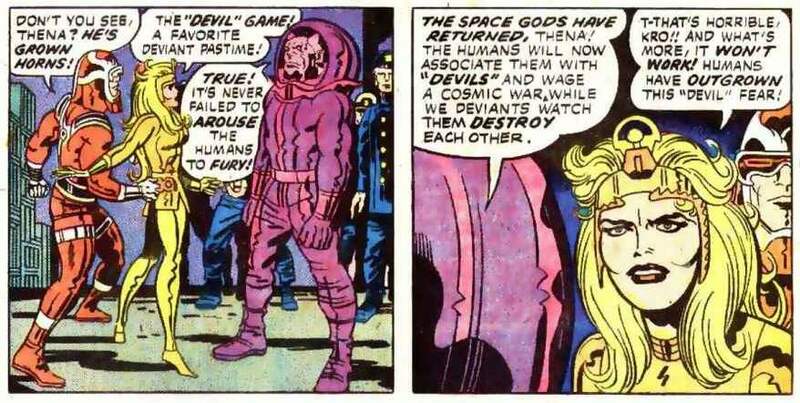 when he produced The Eternals, even though he had explored almost identical themes a decade before with The Inhumans. But it seems that he had been exploring those themes a decade before both Chariots and the Inhumans with this remarkable story. This page here is nearly identical to the opening scenes of Eternals #1, as the scientists discover an underground vault in which the stargods left their legacy for the tribe to study. The scientists are driven away with a weapon remarkably similar to "Greek Fire," which was featured on an episode of Ancient Aliens. 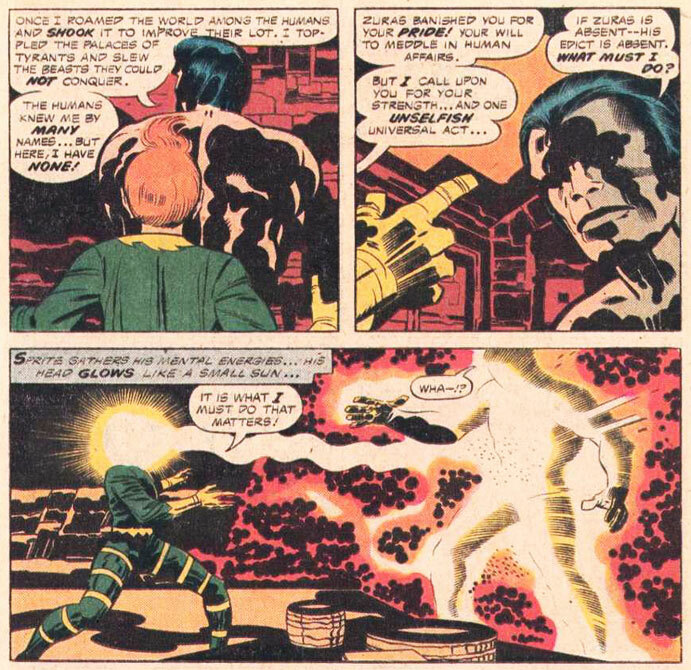 The team also discovers that the statue is in fact alive-- it's an alien stargod in suspended animation. Sandman scribe Neil Gaiman would also explore this theme in his Eternals miniseries in 2006. 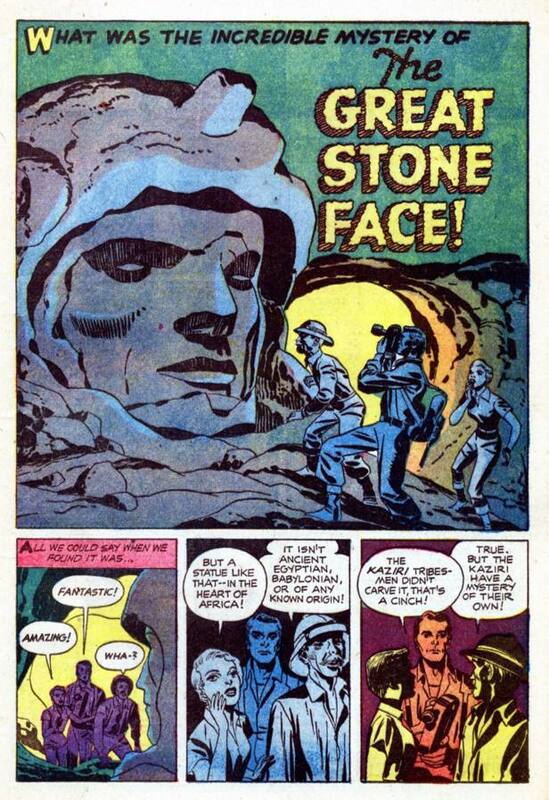 "The Great Stone Face" was published two years before Kirby's "Face on Mars" story and two years before his Easter Island-heads-come-alive story, but certainly reflects the same obsessions. But it also reflects the same obsessions as Eternals #1, which is pretty mind-blowing considering it was published nearly twenty years before it. "The Great Stone Face" was also published a full year-and-a-half before Quatermass and the Pit, six years before the English language version of Morning of the Magicians, ten years before Five Million Years to Earth, eleven years before Chariots of the Gods? and nineteen years before The Twelfth Planet. 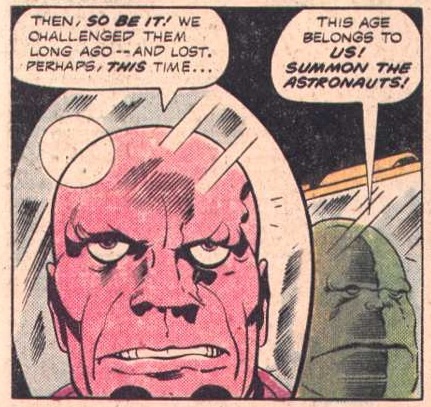 In fact, I'm not exactly sure where Kirby could possibly have read anything about Ancient Astronaut Theory in the American media in 1957, certainly nothing as explicit and doctrinaire as this. I suppose there could have been something (Fort perhaps, but certainly not in this Chariots of the Gods type presentation), the only problem is that I've yet to find it. So, here's where we come to the heart of the matter. 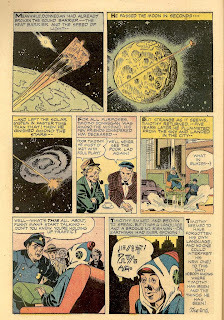 If we look at Kirby's work and recognize his indelible mark on comics, movies and videogames and then we look at his uncanny ability to predict future events, what do we make of his AstroGnostic obsessions? Certainly, those who pretend to speak for him want it all to go away, but the more we look into this the deeper -- and farther back-- it all goes. There is absolutely no way this was all just some kind of diversion for Jack. The record shows that this was an obsession, as deep and as indelible as anything about the man. And to claim otherwise is to gravely misrepresent his work and his legacy. 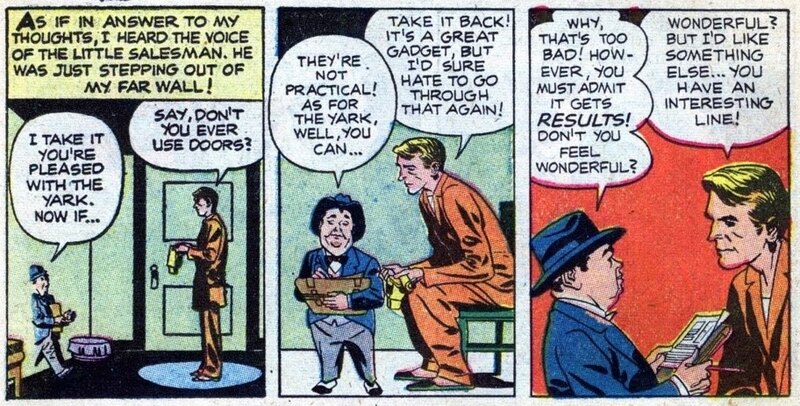 That Jack not only immersed himself in AAT a very long time before it showed up on anyone's radar might well speak to the fact that it undergirds all of his superhero work from the Silver Age on (it's beyond argument that it does starting from the Bronze Age). But there are also more elusive themes that Jack explored time and again, particularly the theme of psychic communion with alien entities, most remarkably told in "Children of the Flaming Wheel." It's almost tempting to wonder if you can't actually separate Jack's AAT obsession and uncanny penchant for prophecy from the psychic/alien contact obsession. It's almost tempting to wonder if the three aren't in fact very intimately linked. 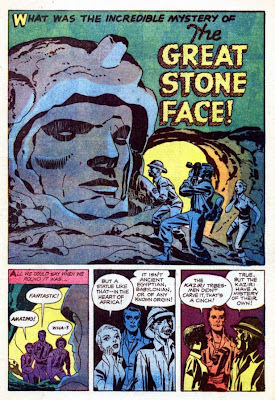 UPDATE: Kirby may well have been influenced by the 1954 book UFOs and the Bible, the only major AAT work in a popular US edition I can find that predates "Great Stone Face." 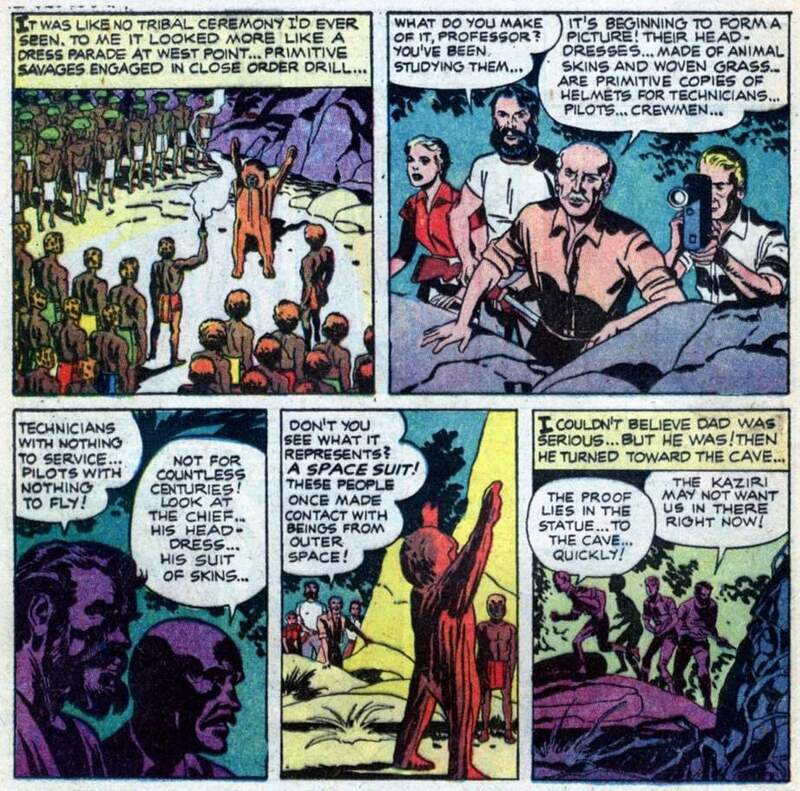 However, this whole idea of the cargo cult is unique, and Kirby may well have come to the conclusion about ancient astronauts after the cargo cult stories emerged after the war.